Did you recently buy some sausage from a local youth group to support their fundraiser? Well, it’s a good thing the holidays are around the corner, because that means it’s potluck season! Are you looking for a party-favourite sausage dish to bring? We’ve got you covered! 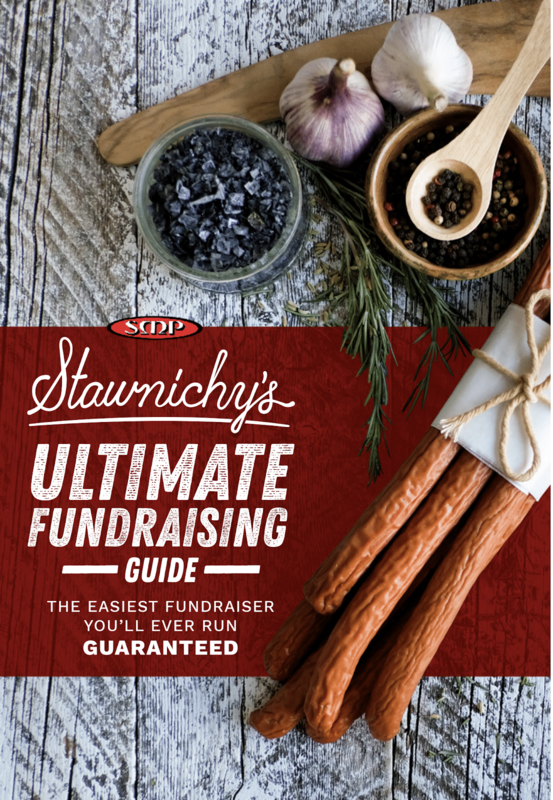 Here at Stawnichy’s, we’ve scoured the internet high and low to share a few sausage recipes from top chefs from around the world. Are you ready to impress your holiday crowd? The following recipes use various types of sausages and we’re happy to let you know we can provide the meat you need at Stawnichy’s! Check out our full product offering and fundraising opportunities for your group! 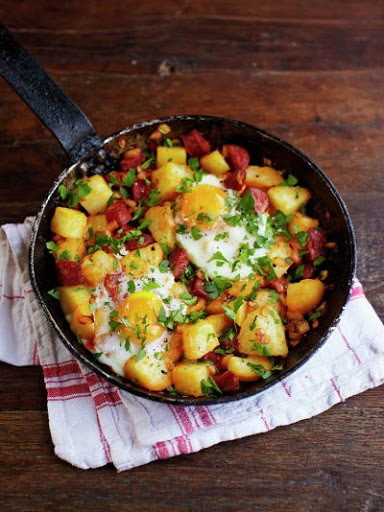 Treat your overnight guests with this delicious breakfast option. This recipe is quick, easy, and hearty – use Stawnichy’s Dry Chorizo Sausage for optimal flavour. Peel and finely chop the onion and garlic, chop the chorizo, dice up the cooked potato and pick and finely chop the parsley. Transfer the pan to the preheated oven and bake for 8 minutes, or until the egg white is set but the yolk is still runny. Sprinkle with sea salt, black pepper and the parsley, to serve. 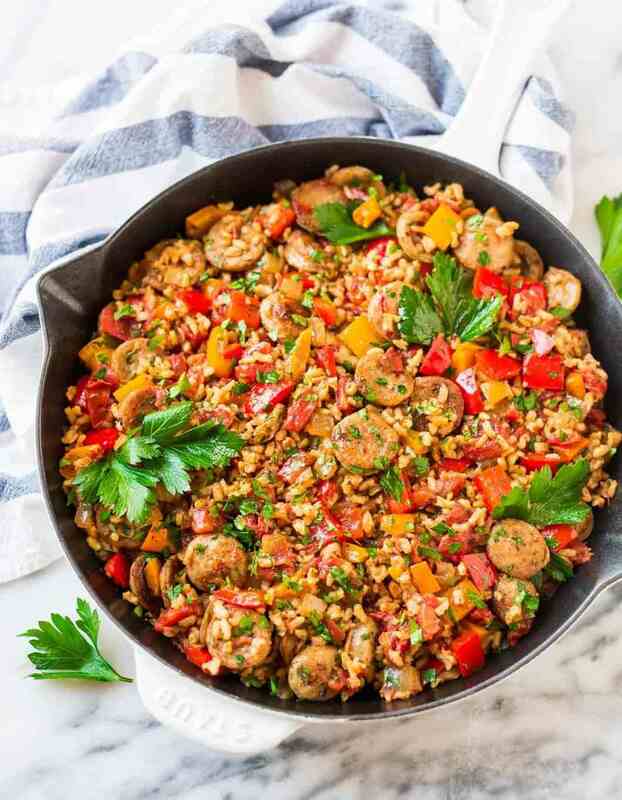 Quick to make, filling for guests, and flavourful for all, this rice dish is similar to a risotto and jambalaya mix. Not limited to a specific type of sausage, Stawnichy provides a plethora of options for your fresh sausage for this recipe. We might recommend our andouille sausage. In a large, deep skillet over medium heat, saute the onion over medium heat in a little olive oil until translucent. Add the pepper, garlic, and chile, continuing to saute and stir over medium heat while they cook for about 3 minutes. Squeeze the sausage out of the casings into the pan, breaking it up with a spoon into smaller bits. Continue to saute and stir over medium heat until the sausage has some color to it and is no longer pink. Sprinkle the smoked paprika over your sausage and veggies, stirring to incorporate. Add the rice and continue stirring. At this point, you can add the wine if you are using it or pour in the chicken broth. Give the works a stir. Turn the heat to medium high to bring the mixture to a boil, then back down to low and allow it to simmer. Keep it at a low bubble for 15 – 20 min until the moisture is all absorbed.Give it a good stir. Remove the pan from the heat and gently stir in the chopped tomato, scallion, and parsley. Enjoy! Comfort food. This pasta dish is exactly what your gathering was hoping for; a perfect compliment to pretty much every other dish you can think of. Sweet or spicy? 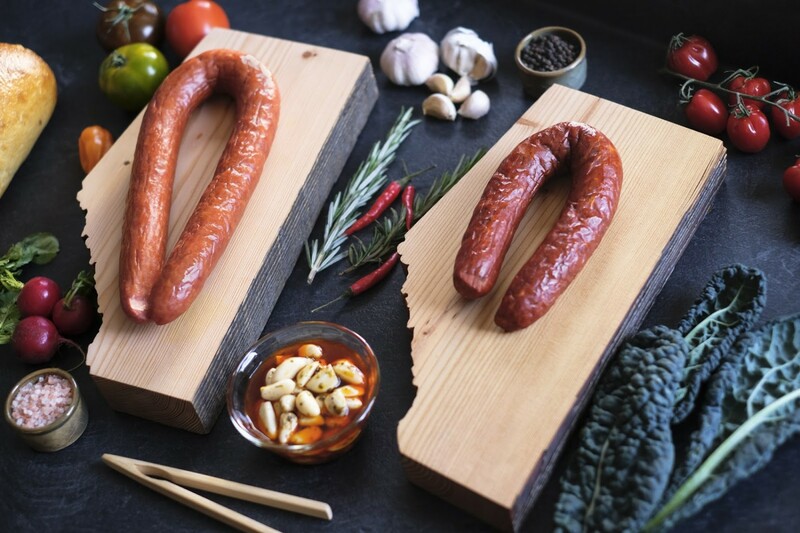 Stawnichy has the perfect sausage for the flavour you want to achieve. All the guests are going to ask you for this recipe! Preheat the oven to 300˚F. Season the oxtail with salt and pepper. In a Dutch oven or large heavy-bottom ovenproof pot with lid, heat the oil over medium-high heat until it shimmers. Add the neck bones and oxtail, working in batches if necessary to avoid overcrowding the pan, and brown on all sides in the oil. Using tongs, remove the browned pieces and set them aside on a sheet pan or platter, which will collect their juices while the remaining pieces cook. Brown the sausages and set aside. Add the garlic, cook for 1 minute, then add the tomato paste, oregano, and pepper flakes and cook for a few minutes, until the tomato paste is dark reddish brown and has begun to stick to the pan. Deglaze the Dutch oven with the wine and let reduce by half. Remove and discard the bouquet garni and keep the gravy and sausages warm. In a large heavy-bottom pot, bring salted water to a boil. Cook the rigatoni according to the package instructions until just al dente. Drain the pasta in a colander and return it to the hot, empty pot. Toss the rigatoni gently over medium heat for about 30 seconds to dry it completely, using tongs if necessary to keep it from sticking to the sides of the pot. Ladle in as much of the warm sauce as necessary to coat but not drown the pasta. Serve the pasta and sausages together, with the extra sauce and grated Parmigiano-Reggiano alongside. Okay, maybe we lied. This is probably the ultimate comfort food. Rachel Ray does it again! This superwoman has graced the internet with yet another phenomenal recipe. Don’t wait until your next holiday party; your kids will love this as much as the next person. Preheat a large cast-iron skillet over medium-high. Cut the neck off the squash; peel and cut into 1- to 1 1/2-inch cubes. Reserve the bulb portion to roast for another meal. Add the olive oil to the skillet, two turns of the pan; add the sausage. Cook, stirring occasionally and breaking up into bite-size pieces, until browned, about 8 minutes. Using a slotted spoon, transfer the sausage to a bowl. Add the butter to the skillet. When it melts, add the sage; cook until crispy and the butter browns, about 2 minutes. Using a slotted spoon, transfer the sage to a paper towel. Add the garlic to the skillet; stir until fragrant, 1 to 2 minutes. Add the squash; season with salt, pepper and nutmeg. Add the wine and cook, stirring often, until reduced a bit, about 1 minute. Add 1 1/2 to 2 cups stock, depending on how saucy you want the dish to be, and bring to a bubble. Add the sausage; transfer to the oven. Roast until the squash is tender, 12 to 15 minutes. Salt the boiling water, add the gnocchi and cook until they float to the surface, about 3 minutes. 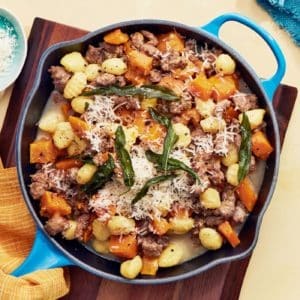 Drain and toss with the squash and sausage sauce; season. Top with the sage leaves. Serve with the grated cheese for passing at the table. Stawnichy’s sausage and wine in one recipe? Need we say more? In a large skillet, cook sausages over medium-high, breaking up meat with a spoon, until browned, 5 minutes. Transfer 4 cups leeks to an airtight container and refrigerate for later use. Add remaining leeks (4 cups) to sausage in skillet and cook until softened, 5 minutes. Add wine and cook, stirring frequently, until mostly evaporated, 2 minutes. Stir in butter and season to taste with salt and pepper. Meanwhile, in a large pot of boiling salted water, cook pasta according to package instructions. Reserve 1/2 cup pasta water. Drain pasta, return to pot, along with sausage mixture, and toss to combine. 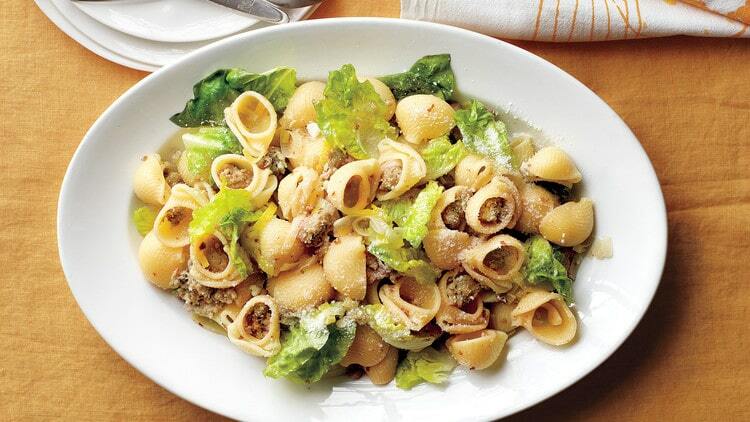 Add lettuce and enough pasta water to create a light sauce that coats pasta. Toss to combine. Serve with Parmesan on the side. So? Did these recipes make you want to try something new? Maybe there’s a potluck get together coming up and you still need to bring a dish? Sausage, of course! Raise funds for a group your child and/or you are a part of! Stawnichy’s is here to help you succeed!